Picturing Disney: Mondays Bite! 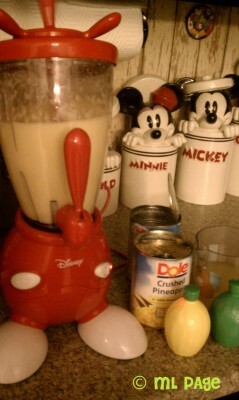 Pineapple Dole Whip Recipe! This recipe originally came from the blog Prudence Pennywise. It is my 3rd attempt at Dole Whips so I made sure I read up on making my own soft serve before I took the plunge. I also made sure this recipe was different then my previous two flops! I altered it ever so slightly to make sure it would work taste-wise from what I had learned from my past experience- the results were Cap’n Cooks-worthy! 1) Drain 1 cup of pineapple juice from your 2 cans of pineapple (this will leave you approx 2 tbsp juice with your fruit and leave you enough pineapple juice to make 1-2 floats if you’d like! 2) Blend together pineapple, lime juice, lemon juice, and sugar until smooth. 3) Pour into freezer bag (I double bagged to be safe) and freeze approx. 2 hours (should be slushy but not frozen). 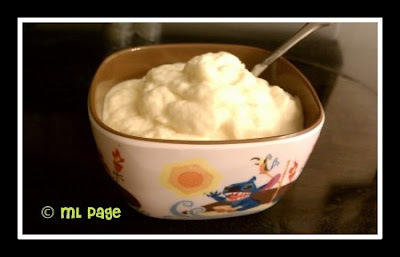 4) Remove from freezer, pour contents into bowl and blend with whipped cream (don’t use a hand mixer here, just blend together with a spoon or fork). 5) Return to freezer until completely frozen (another 1-2 hours).